* NIGERIA & CAMEROON (RLPB 272), where Boko Haram continues its jihad for a Sharia State. * IRAQ (RLPB 273), where Christians have been almost entirely ethno-religiously cleansed from Nineveh Province. Only the most elderly and frail have remained in their homes, forced to either convert to Islam or pay jizya (protection money) to survive. Nineveh's Christians fled en masse into Iraqi Kurdistan where churches are struggling to cope with this massive humanitarian crisis. UPDATE: Praise God, some 300 Christian families, comprising a total of some 1200 people, who had previously been living in an open field, have now moved into a shopping mall in the Kurdish capital, Arbil. An elderly woman told reporters: 'We have been in this building more than a week and we thank the owner of the building for sheltering us. The building is well aired. But there is no aid reaching us. We are suffering from a shortage of drinking water, food, medicine and milk for children ... .' Indeed, the overall situation remains dire. 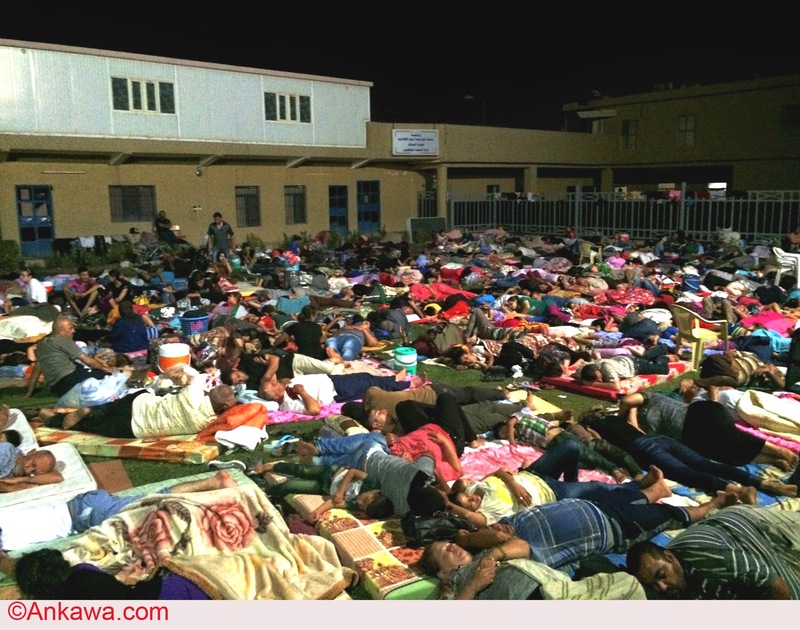 According to the Assyrian International News Agency (AINA) at least five refugees are dying daily. There is a desperate need for humanitarian aid in both Arbil and in Dohuk. 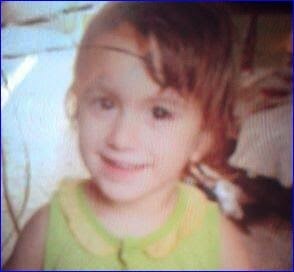 In Breaking News, AINA has learned that a 3 year-old Assyrian girl named Christina Khader Christian Ebada, was taken from her family as they fled Qaraqosh. The family's last sight of Christina was of her crying as she was taken away by heavily bearded ISIS jihadists at the Khazar checkpoint. In what is a truly remarkable development the President of the Kurdish Regional Government (KRG), Massoud Barzani, announced on 18 August that the KRG will accept Assyrian Christian volunteers into the Kurdish armed forces, so that they may protect their homes and villages from the Islamic State (ISIS). May 'baal perazim' -- the Lord of the breakthrough -- go before them. * UKRAINE (RLPB 274), where conflict erupted after an opposition protest was hijacked by unsavoury elements seeking empowerment, and exploited by foreign powers prepared to risk Ukraine's unity in pursuit of their own interests. A massive propaganda war is under-way. Beneath the belligerence is terrible human suffering and a rapidly escalating humanitarian crisis (BBC). There is a desperate need for a cease-fire, a political solution, long-term peace and reconciliation. Pray that the churches -- which are under immense strain -- might lead the way in peace and reconciliation; for the future of Ukraine and for the glory of God. The Chinese Communist Party (CCP) is resurrecting an old, tried-and-failed strategy through which the administration of President Xi Jinping believes it can control the growing Christian Church. The strategy is known as 'theological reconstruction', and the CCP's plan is to construct a theology that makes Chinese Christianity compatible with Chinese socialism. To put it another way: the 'Sinicisation of Christianity' is aimed at constructing a state-approved theology which will serve CCP interests. According to the director of the State Administration for Religious Affairs, Wang Zuoan, this will facilitate the growth of Christianity. However, when this strategy was last implemented (in the 1990s) all it facilitated was escalating persecution which failed to eradicate traditional believers. It seems the Chinese Church is facing a new wave of persecution. 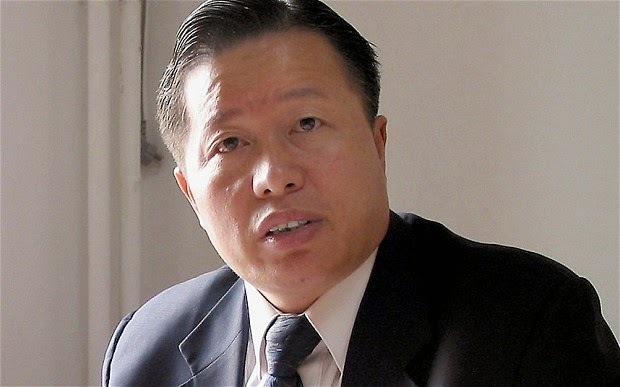 Internationally recognised Chinese human rights lawyer Gao Zhisheng (50), known for his courageous defence of persecuted Christians, has been released from detention. 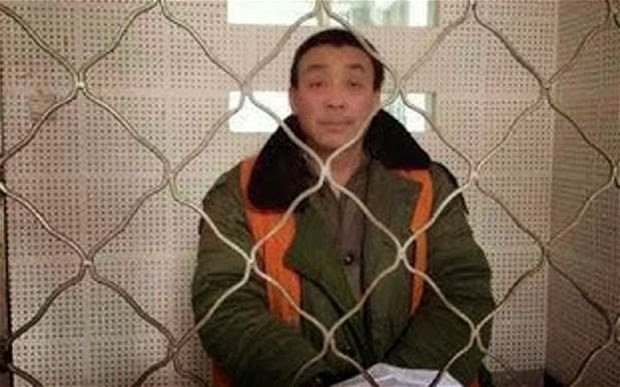 Gao was arrested in December 2006 and tortured severely while serving a three-year sentence. In April 2010 he was 'disappeared' to a secret 'black jail'. Eventually in December 2011 the authorities reported that Gao had been returned to prison for another three years. Released on 7 August 2014, it appears Gao had been kept in solitary confinement the whole time: no communication, no books or input of any kind. Each day he was fed one slice of bread and one piece of cabbage. Consequently he has lost 22kg and his teeth have rotted due to malnutrition. Furthermore, it seems Goa has been repeatedly tortured; reportedly he is able to speak only in short sentences and much of what he says is unintelligible. He has not been able to see a doctor. Gao's wife, Geng He (who now lives in the US) is appealing to the Chinese authorities to allow her husband to travel to the US for medical treatment. Pray for Gao Zhisheng and that he will be able to get to the US. Many are concerned that he might 'disappear' yet again. Doubtless the CCP's plan is to make sure all Chinese human rights lawyers get the message: this is what happens to those who challenge the CCP! Please pray. Pastor Zhang Shaojie of Nanle County Christian Church, Henan Province, was arrested in November 2013 along with 23 other church members as they attempted to petition the authorities about a land dispute. The church maintained that CCP officials were trying to seize the land on which the church was built. On 4 July 2014 Zhang was fined and sentenced to 12 years' imprisonment for fraud and 'gathering a crowd to disturb public order'. On 21 August Zhang’s lawyers were informed their appeal had failed -- the court was upholding the original ruling. The severity of the sentence clearly demonstrates repression is escalating. Critics of the government believe that Pastor Zhang, a prominent leader, has been set-up as the CCP seeks to stem the growth of the Chinese Church. 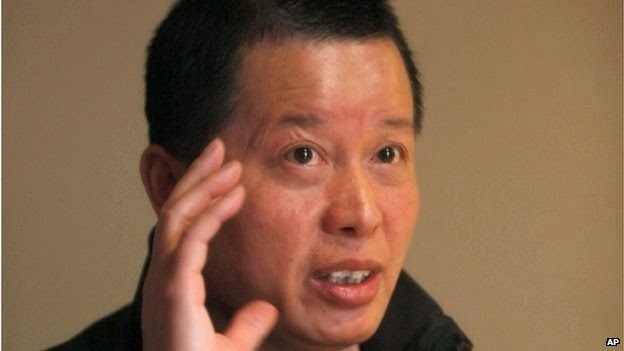 Outspoken human rights lawyer, Zhang Xuezhong, maintains the CCP is cracking down on Christianity as part of a campaign aimed at weakening or eradicating any ideological challenge or source of alternative leadership. Pray for the Church in China. 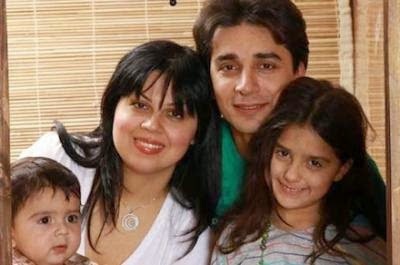 On 19 August Pastor Farshid Fathi (35) was also transferred from Evin to Rajaei-Shahri. A married father of two, Pastor Fathi was arrested in a Christmas raid on 26 Dec 2010 and subsequently sentenced to six years in prison. Facing extreme pressure from Iranian Intelligence, his family subsequently fled to Canada via Turkey. Nobody knows why Farshid was transferred to Rajaei-Shahri prison. The move puts his life in extreme danger. -- an extended prayer bulletin. Independent from Russia only since 1991, Ukraine is not a monolithic state. Rather, it is an ethnic-religious 'fault-line' state. The north-west is predominantly ethnic Ukrainian, Ukrainian-speaking and Ukrainian Orthodox and Catholic. The south-east is predominantly ethnic Russian, Russian-speaking and Russian Orthodox. The divide is reflected in voting patterns, making Ukrainian unity extremely fragile, something to be handled with great care. When Ukraine held elections in 2010, opinion polls predicted that Viktor Yanukovych would win -- and he did, convincingly. In the parliamentary elections of 2012, Yanukovych's Party of Regions won 185 of 450 seats, 84 seats clear of its next rival. As party leader, Mykola Azarov became Prime Minister. None of this was surprising. What was surprising was the rise of the Ukrainian ultra-nationalists and neo-Nazis. Svoboda, formerly known as the Social National Party of Ukraine, won 37 seats in the parliament (almost 10 percent of the vote), having won none in the previous election. These groups are vehemently anti-Semitic and anti-Russian. In November 2013 opposition forces protested in Kiev, unhappy that Yanukovych had signed a trade pact with Russia rather than the EU. Actually the deal being offered by oil and gas-rich Russia was much better than the deal being proposed by the cash-strapped, pro-austerity EU. In a democracy, protests are permitted with the expectation that they will be civilised. In Kiev, however, a coalition of anti-government, ultra-nationalist and neo-Nazi forces -- including numerous neo-Nazi paramilitaries united under the umbrella of the Right Sector -- joined the protest, strengthening it and putting it on a dangerous course. Anti-Semitism soared to the extent that Israel was forced to airlift Jews out of Ukraine. 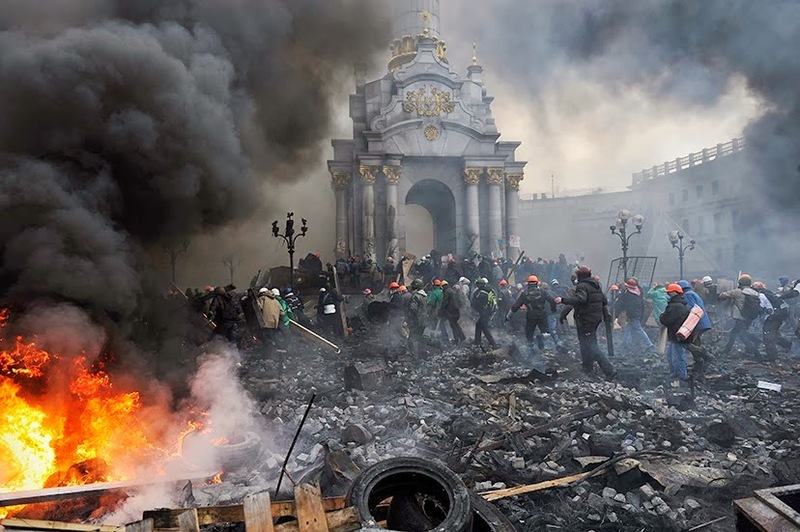 As Kiev started to resemble a war zone, the EU (led by Germany) and the US entered the fray, backing regime change. Eventually, Yanukovych fled to Russia and the US installed its man, Arseniy Yatsenyuk, as Prime Minister. An interim government was formed that ensured the neo-Nazis and Right Sector militants, who had made regime change possible, were rewarded. In their first act of legislation, the new regime voted to repeal the law that recognised Russian as an official language in Ukraine. Only when the EU objected did interim president Oleksandr Turchynov reverse the ruling. It is unsurprising that eastern Ukraine's ethnic Russians felt disenfranchised and threatened and that predominantly Russian eastern regions subsequently voted to secede. Rather than dialogue, Kiev opted for a punitive military campaign under the implausible pretext of 'anti-terror'. This campaign is taking on all the characteristics of ethnic cleansing. Western silence seems to indicate that ethnic cleansing is permissible when the victims are ethnic Russians. That looks like racism to me (EK). The United Nations High Commission on Refugees (UNHCR) reported on 5 August 2014 that Ukraine now has 117,000 internally displaced people (IDPs) with eastern Ukrainians making up 87 percent of the country's IDPs. On 1 July, President Petro Poroshenko ended a ceasefire and ordered his forces to purge the region of 'dirt and parasites'. Unsurprisingly, the number of displaced people from the Luhansk and Donetsk eastern regions has risen sharply from 2,600 in early June to 102,600 at the start of August, with a further 6,200 civilians forced from their homes in the first week of August. The UNHCR has complained to Kiev about lack of co-ordinated relief efforts and the paucity of shelter, especially with winter approaching. Furthermore, the UNHCR reports that masses of Ukrainians are fleeing to Russia under the visa-free regime; Russian authorities estimate the figure to be some 730,000 Ukrainians. Jews are leaving for Israel. These refugees are fleeing endless shelling and the advance of neo-Nazi Right Sector militants. According to Kiev's own figures 1,129 civilians had been killed in eastern Ukraine and 3,442 injured by 28 July. Russia is pressing for an unconditional cease-fire and the start of political dialogue but Kiev is resisting. Russia has appealed to the US to use its influence with Kiev to get the Right Sector paramilitaries reined in and disarmed. Right Sector militants have been engaged in such unlawful actions in eastern Ukraine that Ukrainian police have been forced to arrest them. 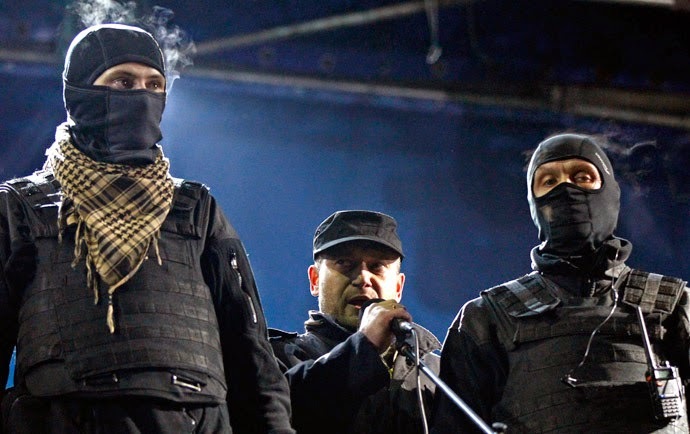 Right Sector head Dmitry Yarosh (the interim government's Deputy Secretary of National Security) responded on Saturday 16 August by slamming the police as 'anti-Ukrainian'. He threatened 'to call off all our units on the front line, start a general mobilisation of reserve battalions and launch a march on Kiev'. The next day Yarosh called off the march on Kiev when the authorities had agreed to release all Right Sector militants who had been detained. Because the West has supported undemocratic regime change, ignored the rise of anti-Semitic and anti-Russian Ukrainian ultra-nationalism and is now tacitly supporting the ethnic cleansing of the eastern regions, it has made itself into an enemy. 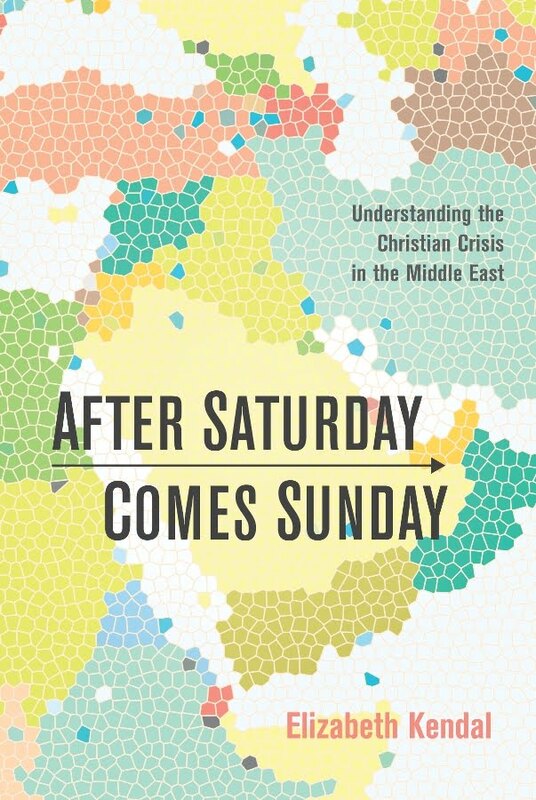 This puts all Protestants and evangelicals living and especially ministering in the eastern regions in serious danger as rebel fighters will assume they are aligned with the enemy. Recently four volunteers with Far East Broadcasting Company (FEBC; gospel radio) in eastern Ukraine were taken captive and then savagely beaten to death, reportedly by militants from a separatist militia. Two of those killed were brothers and one was the father of eight children. FEBC's radio towers in eastern Ukraine have been crippled in the fighting and a partner church has been overrun by rebels. If ever Ukrainians needed to 'tune in' to the gospel, it is now. So too the belligerent, self-interested foreign powers that are fanning the flames of this totally unnecessary conflict. * impress on the consciences of local and foreign leaders the urgent need to trade ambitions and 'interests' for peace-making and healing so that Ukraine's real and deep-seated problems will be addressed peacefully in the interests of the people. * magnify the voices of Christian leaders who are denouncing racial hatred and all manner of violence; may he supply FEBC and all other Gospel ministries with all their needs so they can speak grace and hope into this desperate situation and witness to the power of the Holy Spirit. The United Nations High Commission on Refugees (UNHCR) reports that Ukraine now has 117,000 internally displaced people (IDPs), 87 percent of whom are from predominantly Russian eastern Ukraine. Furthermore, the UNHCR reports that masses of Ukrainians are fleeing into Russia, which estimates the figure to be 730,000. Jews are leaving for Israel. The refugees are fleeing Kiev's endless shelling and the advance of neo-Nazi Right Sector militants. The violence has escalated markedly in recent months and now has the characteristics of ethnic cleansing. Russia is pressing Kiev for an unconditional cease-fire ahead of talks. Western silence is shameful. 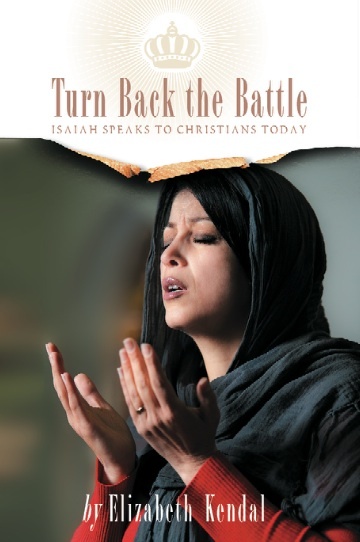 May the Lord of the Breakthrough (2 Samuel 5:20) empower the Church to break through the historic ethnic hatreds and lead the way in peace and reconciliation. In June ISIS flooded into Nineveh, northern Iraq, and captured Mosul in a blitzkrieg, forcing thousands of Christians to flee for their lives. After a failed attempt to advance on Baghdad, ISIS consolidated in Mosul, declared a Caliphate covering north-east Syria and north-west Iraq, and renamed itself the Islamic State (IS). It then expelled Mosul's remnant Christians, who limped into exile with nothing but the clothes on their backs. Now it appears IS has fixed its sights on the oil-rich frontier of Iraqi Kurdistan. Whilst officially Kirkuk is disputed territory, the Kurds exploited insecurity in July to seize control of the oil-rich territory they have long claimed is rightfully theirs. Just 107 km north of Kirkuk is the city of Arbil (also spelt Erbil or Irbil), the capital of Iraqi Kurdistan. Archbishop Athanasius Toma Dawod of the Syriac Orthodox Church in the UK said that IS's capture of Qaraqosh had marked a turning point for Christians in the country. 'Now we consider it genocide -- ethnic cleansing,' he said. 'They are killing our people in the name of Allah and telling people that anyone who kills a Christian will go straight to heaven: that is their message.' He said IS had burnt churches along with invaluable ancient books and manuscripts, and that some churches had been converted into mosques. Indeed, the Iraqi Security Forces will not be fighting terrorists in the north any time soon. When Iraq's newly elected parliament failed to elect a Prime Minister, and with most agreeing that the incumbent PM al-Maliki -- a polarising figure -- should not lead the next government, the president stepped in to resolve the crisis. Under the Iraqi constitution, the president may appoint the chosen nominee of the largest parliamentary bloc to form a government. On 11 August Iraqi President Fouad Massoum announced he had approved the nomination of Haider Abadi for PM. Al-Maliki immediately rejected this, insisting that it was his constitutional right to be nominated for a third term on the grounds that he heads the largest party in the largest bloc. Refusing to step aside, al-Makili has mobilised his troops, having spent his last eight years as PM consolidating his power by promoting military officials on grounds of loyalty rather than merit. So Baghdad fiddles while Iraq burns. UPDATE: on Thursday 14 Aug, Nuri al-Maliki stepped aside after his own party turned against him. 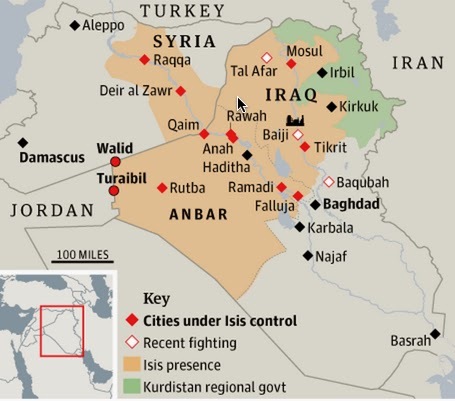 A new government will now work to unite Sunnis in what will be a long fight against IS. On Sunday 27 July Boko Haram militants attacked the Saint Charles Catholic Church in the predominantly Christian Sabon Gari district of Kano. The militants threw an IED (improvised explosive device) at worshippers coming out of the morning service, killing five and wounding eight. On Wednesday night 30 July Boko Haram militants invaded Kwajaffa, Tashan Alade and other communities in the predominantly Christian Hawul Local Government Area (LGA) of Borno State. The militants used IEDs and petrol bombs to set alight and totally raze at least five churches before threatening to return to torch the Hawul LGA HQ Secretariat. An eye witness reported that no lives were lost and only churches were targeted, and the militants operated freely without interference from security services. Northern Nigeria has recently suffered a spate of suicide bombings in which all the bombers were teenage girls. One in Kano on Sunday 27 July; two in Kano on 28 July; two in Yobe on 29 July and another in Kano on 30 July. [See Religious Liberty Monitoring (31 July 2014) for full details.] Naturally this new trend of using teenage girls as suicide bombers has caused a shroud of horror to descend over the Christian enclave of Chibok, from where Boko Haram snatched over 200 schoolgirls in April. [See RLPB 257 (22 April 2014)]. Citizens are calling for expert forensic DNA testing to ascertain the identities of the girls, as there are fears that Boko Haram might be using the mostly Christian teenage girls abducted from Chibok as human bombs. On Sunday morning 27 July Boko Haram launched a daring raid into Cameroon's Extreme North. Hundreds of militants wearing Cameroonian army uniforms stormed the town of Kolofata, just 5km from the Nigerian border (82km north of Maroua), shelling and shooting indiscriminately. They targeted the home of Amadou Ali, Cameroon's Deputy Prime Minister. Mr Ali was not there, so the militants abducted his wife and her maid. They also seized the influential community leader and Sultan of Kolofata, Seiny Boukar Lamine, along with his wife and five children. At least 18 civilians and security personnel were killed in what was an extremely violent raid. The militants also targeted the local hospital, apparently in search of two workers of Western origin, who turned out to be away on holidays. A recent report in New York Times says al-Qaeda has been earning most of its funds from ransoms paid for kidnapped Europeans. On 29 July Cameroonian soldiers rescued Mrs Ali, but at least 16 people died in the rescue operation. On Thursday afternoon 24 July Boko Haram launched a massive attack targeting Cameroonian military positions at Bargaram (also close to the Nigerian border). Between 500 and 600 militants stormed the town and ten Cameroonian soldiers died in the fire-fight which lasted well into the next day. An unknown number of people were abducted, among them Pastor Jean Marcel Kesvere (45). World Watch Monitor reports that Pastor Jean's body was found on Monday 28 July, dumped in the bush just a few kilometres from Bargaram. He leaves a wife and eight children. The entire Christian community is in shock, especially the members of the local Lutheran Brethren Church where Pastor Jean served for the past two years. * 'frustrate the ways of the wicked' (Psalm 146:9c NIV) and bind the powers behind Boko Haram (Matthew 18:18) so that the group will know only failure until it is totally discredited amongst Muslims; may its evil be exposed until all Nigerians reject it completely. Pray Psalm 77 for the Chibok schoolgirls. Northern Nigeria has recently suffered a spate of deadly church attacks and suicide bombings. In six bombings in four days, all the suicide bombers were teenage girls. Many are therefore questioning if Boko Haram is using the mostly Christian schoolgirls abducted from Chibok in April as human bombs as well as human shields. The group has also launched several large-scale daring raids into Cameroon's Extreme North in which many have been abducted and killed, including Pastor Jean Marcel Kesvere (45). Pastor Jean leaves a wife and eight children and a Christian community in shock. Christians across Northern Nigeria are wondering if they will ever again know peace and security. Pray that God will intervene and bind the powers behind Boko Haram. Please pray for Nigeria and Cameroon.